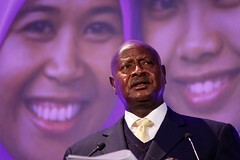 President Yoweri Museveni of Uganda, has given Machar 4 days to comply with cease fire or face military action. Ugandan president Yoweri Museveni has threatened regional military efforts against forces loyal to South Sudan‘s ex-vice-president Riek Machar, if he fails to honour the ceasefire reached in Kenya on Friday. Museveni, currently in the South Sudan capital, Juba for talks with his counterpart Salva Kiir, said Machar was given four days to comply or risk military defeat. “We gave him [Machar] four days and [agreed that] if he doesn’t [comply with the agreement], then we shall have to go for him”, the Ugandan leader told reporters in Juba on Monday. Museveni, a close ally of Kiir, admitted for the first time that he sent his troops to “help restore hope” in South Sudan, which confirms earlier claims that the Ugandan army was involved in the conflict. “Yes, we sent some forces. They are under the orders of President Salva Kiir, to see how we can help restore order,” Museveni said. On Friday, Machar told Sudan Tribune that a Ugandan MiG-29 bombed rebel-held positions around Bor, before they were retaken by military forces loyal to president Kiir. He condemned the attack, saying Uganda was interfering into South Sudan’s internal matters. The Intergovernmental Authority on Development (IGAD) regional leaders have initiated dialogue as way of resolving the country’s conflict, which has since killed over 1,000 and displaced over 60,000. Diplomats and the international community have already proposed dialogue as the only way of resolving the worst-ever outbreak of conflict in the country since its independence in July 2011. It now remains unclear what trend the conflict is likely to take should regional leaders form a military coalition against Machar-led forces. Posted on 30th December 2013 by newsafrica. This entry was posted in Africa, African Security, Democracy, Rwanda, South Sudan, Sudan (North), Tanzania, Uganda. Bookmark the permalink.